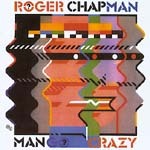 This is a reissue of the 1983 Roger Chapman solo album that gave him his first taste of chart success in Europe. Mango Crazy was the first of a number of self-produced chart hits for the former Family vocalist in the eighties. This resulted in him receiving a lifetime achievement award in Germany during 2003 for his contribution to music in Germany during the eighties period. Once again, Roger teamed up with song-writing partner and guitarist Geoff Whitehorn. Featuring a bonus track, extensive liner notes and quotes from band members and some previously unseen photographs.